Are you going to be Colombina this Mardi Gras? Colombina is a Commedia Dell’Arte character. She is often presented as Harlequin’s girlfriend. Pedrolino is also deeply in love with her but she doesn’t care about his sentiments. Naturally, she is not the kind of woman who is accustomed to shut her mouth when she does not want to. While Colombina can be arrogant; she is also stupid and grasping. In addition, she always hurts the two men who are in love with her. If you are a woman or a girl, chances are that you’re going to want to feature this woman at your upcoming party. Here is the makeup you are going to reproduce on your blank female mask so as to make it look like Colombina’s face. Optional: wear a long sleeved white shirt on a long ballerina tutu. 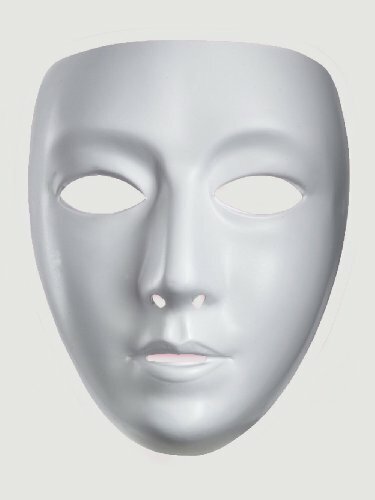 If you wish, you can use the mask template to create a stunning makeup. Also, if you aren’t comfortable with a full face mask, you can use a half face one. You will only have to paint your face white and put hot red lipstick on your lips. As you can see, it’s not that hard to become one of the theatre and Venetian Carnavale’s most popular female character. Tagged colombin costume mask, how to make a colombina mask, how to make a commedia dell'arte mask, how to make a venetian mask, make women's masks, venetian masks for women, venetian masquerade masks.